Highly optimized algorithms for a smooth experience. 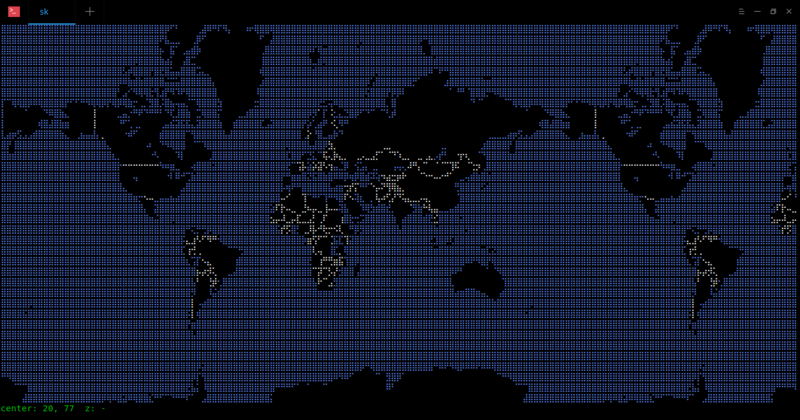 Here is the World map from my Terminal. To switch to Braille view, press c.
Type c again to switch back to the previous format. To scroll around the map, use arrow keys up, down, left, right. To zoom in/out a location, use a and z keys. Also, you can use the scroll wheel of your mouse to zoom in or out. To quit the map, press q. Like I already said, don’t think it is just a simple project. Click on any location on the map and press “a” to zoom in. I can be able to zoom to view the states in my country (India). And, the place where I completed my high school education. Even though, my home town is just a smallest town, MapSCII displayed it accurately. MapSCII uses OpenStreetMap to collect the data. Liked it? Great! You can host it on your own system. Make sure you have installed Node.js on your system. If not, refer the following link. Have fun! More good stuffs to come. Stay tuned! This is really cool. I really like following the articles here. This site made me in fact build up the courage to switch from Mint to Arch (Antergos). There is however one feature from Debian derived distributions I really miss. And that’s crontab. How on earth do one set up tasks similar to cron jobs in arch linux? I would like to run certain scripts every sunday at 1 pm. In Mint that was eay to set up in crontab. It would be awesome if this site could post a detailed tutorial on that matter. I think you have to ‘mess around’ with systemd in arch? Anyway keep the good work up. I’m sure many followers really appreciate OSTechNix! Thank you very much for the positive feedback about our blog. crontab is available in Arch, but with different name. You need to install the package ‘cronie’ (sudo pacman -S cronie) to setup cron jobs. Setting up cron jobs is same as you do in Linux mint. For more details, check this Arch wiki link. https://wiki.archlinux.org/index.php/Cron .And, yes I have added “Systemd” article to my to-do list. I will write about systemd soon. Keep visiting!